We have seen quite a bit of the all-new Nissan NP300 Navara already. In mid-October, the new ‘Mother Trucker’ was open for bookings with two body styles offered, with single and double cab models available. Now, Edaran Tan Chong Motor has provided the media a preview of the pick-up truck in selected variants. 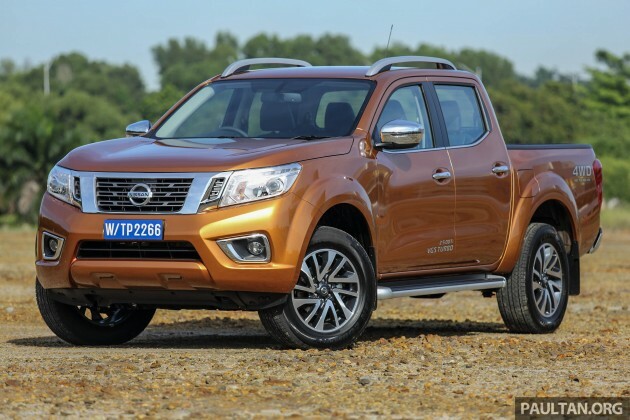 The Nissan NP300 Navara will officially be launched very soon with a grand total of six variants being offered. Estimated prices start from RM85,000 for the manual single cab model. For the double cabs, the E (MT) variant is estimated to cost RM95,000, the SE (MT) from RM104,000, the SE (AT) from RM109,000, the V (AT) from RM115,000 and the top-spec VL (AT) from RM125,000. Speaking of the range-topper, shortly after the order books opened, a Nissan NP300 Navara in VL-spec was put on display at 1Utama Shopping Centre. For this preview however, we were given an up-close look at the Navara for the very first time in E, SE (AT), V and VL variants. Under the hood, all NP300 Navara variants adopt the same 2.5 litre YD25DDTi four-cylinder turbodiesel engine. However, only the mill in the double cab VL-spec churns out 190 PS/450 Nm, while the other variants make do with 163 PS/403 Nm. Transmission-wise, the single cab model along with the double cab E and SE (MT) variants are fitted with a six-speed manual gearbox. Moving up the range, the double cab SE (AT), V and VL variants receive a seven-speed automatic gearbox (with manual override). All NP300 Navara models come with an all-wheel drive system with on-the-fly switching up to 100 km/h. Beginning with the double cab variants, the manual-only Navara E kicks thing off with automatic halogen headlights with matching (bulb-type) DRLs. Elsewhere on the pick-up, there are side steps, 16-inch steel rims, a rear spoiler, silver front grille and black painted door handles. As the entry-level model, the manual folding side mirrors are finished in black and can be adjusted electrically. Inside, the Navara E (above) gets “zero-gravity” manually adjusted fabric seats, a monochrome multi-info display in the instrument cluster, manual air-con (dial-type) with rear vents, and double-DIN multimedia unit with USB/AUX input and a six-speaker system. Moving up the range, the Navara SE (MT and AT) introduces chrome elements to the exterior with the front grille and door handles finished in said material. Other additions include power foldable and adjustable side mirrors with integrated LED turn indicators. Also, 16-inch alloys come into the picture. Continuing on, the automatic-only Navara V packs on additional amenities with an i-Key keyless entry and push start, while the driver benefits from a Fine Vision Meter TFT colour display, a five-inch multimedia display screen linked to a rear view camera, cruise control and steering controls. The air-con is still manual, but is of the push-button variety instead. At the top of the list is the Navara VL that comes with all the bells and whistles including first-in-class LED headlamps with LED DRLs, roof rails and 18-inch alloys. The interior also receives a bump in luxury with an eight-way powered seat (plus two-way lumbar) for the driver. There’s leather on the seats, steering wheel and shift knob. Rounding off the VL’s kit list are a dual-zone automatic air-con and an auto dimming rear view mirror that features a compass that indicates the pick-up’s direction of travel. Finally, the single cab variant, which is available for private registration as well. This workhorse gets a larger flatbed with the omission of the rear passenger cab. The interior is a little sparse by comparison but it does come with a double-DIN radio unit and the dash-top storage tray comes with a 12V power outlet, as per the double cabs. Keep in mind that all double cab models feature rear multi-link suspension (live axle) setup but the single cab retains a leaf spring configuration instead. The EP300 also rides on a fully boxed ladder frame with 31 degree approach and 25.6 degree departure angles, with a ground clearance of 230 mm. Safety wise, all variants come with dual front airbags as standard. The SE (MT and AT), V and VL get an expanded safety suite that includes ABS with EBD and BA, Vehicle Dynamic Control (VDC) and traction control, Active Brake Limited Slip (ABLS), Hill Start Assist (HSA) and Hill Descent Control (HDC). Four colour options – Savanna Orange, Tungsten Silver, Diamond Black, Brilliant White are available for the double cab variants. The single cab model can only be had in Brilliant White. All models are CBU fully imported from Thailand and come with a three-year/100,000 km warranty. Read our review of the new Navara to find out more. Just bring Nissan Titan here Tan Chong. The question we must be asking is, where is Najib’s promise to reduce car prices? Najib also said that by 2020, we would become high income nation. He said our GDP per Capita would be US$48,000. That would mean, per month, the average Malaysian would be earning US$4000 (RM18,000) per month. Do you see the average Malaysian earning RM18k per month by 2020? Well, how many who can afford above 120k rides want to get a truck? Top up get a descend SUV. dun forget SUV near this price range (120-150k) is powered by petrol engine which is not really powerful compared to turbocharged diesel. Why is this car so expensive? Very simple. It is because of Songlapping. One man can songlap RM2.6 billion is just one news we know. What about the other times he songlap that we don’t know about? I think it runs to hundreds of billions. Taib songlap US$20 billion (RM84 billion) also nothing happen to him. Infact he was rewarded for his songlap and made Governor and given a Tunship. What about the songlaps by the other Menteri and Government officials? It all runs to hundreds of billions per annum the Songlap. This is why we get low spec lousy cars with super high prices. Our guardians are more interested in Songlap than fighting for the rakyat to get good and safe cars that are also reasonably priced. what a stupid comment. some more got stupid ppl thumbs up. decent & descend also cannot tell. go check out FORD WILDTRAK waiting list. Top Spec Navara RM125k compared to bare spec RM85k, suddenly car price drops by 30%. The government is correct all along. Nissan stuffed up. They should have at least had the flagship to have the full airbag suite, cause really, the Navara looks really good if not for this rather glaring omission, compared to the Ranger. To quote someone during the PC … This is more powerful than one american pick up launched recently. Or something like that. Came out in tv3 news. Got East Malaysian mah. Scare no business meh? Aiyo, those monkey can’t afford. Better buy Proton Exora.. cheap and tough.. I tell you, east malaysia 10car pickup on road got 6 is hilux 2dmax 2ranger..
One key feature was not mentioned is the multi-link coil spring rear suspension setup that’s supposed to offer best rise and handling in its class. All double cab with rear multi link or only the VL spec with multilink? I saw above photo the SE MT with leaf spring. All running multi-link except single cab. Why is there a mysterious hole under the front passenger side air vent? Is that supposed to be a cup holder? I reckon its a cup holder. WTF man Tan Chong, so cheapskate, took off the cup holder just to save that little cost? Previous Post: Brabus Rocket 900 Desert Gold Edition – 1,500 Nm!